To add more variety to this blog, I am starting a new series called "Get It or Forget It" to share my thoughts on non-fashion related items. First up is the Cover Girl Outlast Foundation. This is my 2nd bottle and I absolutely love it! For the most part, I am a drugstore makeup kind of girl. I think a lot of drugstore cosmetic companies stepping up their game lately. If you do your research, you'll find some amazing products. I used the entire bottle of this foundation and I am about 1/3 way done with my second bottle. This particular foundation keeps my face matte all day. I put on my makeup around 7:00am and my face stays matte until 3:00pm without any touch-up. 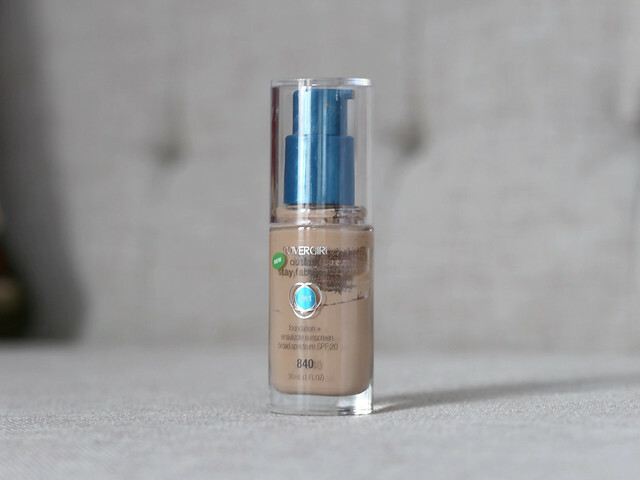 This foundation feels lightweight on my face even though it is a medium coverage that can easily be built up into full coverage. It also contains SPF 20 which is always a plus. I am currently wearing shade #840 and it suits my skin tone well. I don't wear foundation everyday but on days that I need to, this is what I will reach for. Click here to read my other "Get It or Forget It" posts. Disclaimer: This is not a sponsored post. Just wanted to share a good product. Great! I never tried this one! I'll have to check this one out, thanks for sharing! @Anna Hi Anna! I got this foundation from a supermarket chain (Giant Eagle). They do have testers in store. Unfortunately, I don't know an easy way to color match foundation at the drugstore.